Advocacy Of A Particular Climate Science Perspective By A Panel Sponsored By The American Geophysical Union | Climate Science: Roger Pielke Sr.
We are pleased to introduce 24 trained Catholic Climate Ambassadors. These 24 Ambassadors are available to offer presentations on the moral implications of climate change consistent with Catholic teaching as outlined by our Holy Father in his World Day of Peace Message of 2010, If You Want to Cultivate Peace, Protect Creation, and in the U.S. Catholic bishops’ statement, Global Climate Change: A Plea for Dialogue, Prudence and the Common Good. Since 2006, the Catholic Coalition on Climate Change, the organization responsible for the Ambassador program, has played a pivotal role in the U.S. Catholic response to the enormous challenge of climate change. The Coalition and its many partners, including the US Conference of Catholic Bishops (USCCB), has developed strategies for to foster the spiritual formation and education of Catholics, to create resources, programs and projects that engage youth, families and parishioners, and to spur action that leads to public policy change at local, national and international levels. The Catholic Climate Ambassador program is intended to accelerate these efforts by raising the awareness of Catholics around the U.S. who worship in our parishes, learn in our schools and lead our many ministries. The Ambassadors are charged with promoting the Catholic Climate Covenant: The St. Francis Pledge to Care for Creation and the Poor. Please contact any of the following Ambassadors for a speaking engagement. Ambassador travel expenses are expected to be covered by the Organization sponsoring their speaking engagement. Education: Ph.D., Aeronautical and Astronautical Engineering with a minor in Electrical Engineering, Stanford University, M.S., Aeronautical and Astronautical Engineering, Stanford University, M.A., Management and Supervision, Central Michigan University, B.S. Aeronautical Engineering, United States Air Force Academy Background: Dr. Strawa has spent the last 20 years of his professional life working as an Atmospheric Scientist with NASA, and is currently the Chair of the Diocese of San Jose Climate Change Initiative. Dr. Strawa recognizes climate change as one of the great challenges facing humanity this century from a scientific, economic, and ethical perspective, and feels called to motivate people to more fully address climate change through their Catholic faith. Dan Satterfield – author of Dan’s Wild Wild Science Journal blog and chief meteorologist for WHNT-TV (which he just resigned from; see). Besides this journal, I’ve also developed the Wild Wild Climate page, and am working on a complete refresh of my Wild Wild Weather page. The Wild Wild Weather Page has been online for 15 years now! One of the reasons I started writing this blog, is the huge amount of disinformation online about real science and especially climate change.In spite of what you may have heard, scientists are no longer debating whether the Earth is warming, or if humans are causing it. The definitive answer to both questions is settled. It’s yes. The release of the emails is likely connected to the release of the BEST study headed by Dr. Richard Muller. Muller was the darling of the deniers after expressing some doubts about the accuracy of the surface temperature record. With the rapidly dwindling numbers of skeptics in the science community, Muller was their last, best hope. Imagine their horror, when his much heralded independent study of the temperature record, ended up confirming NASA, NOAA and the UK Hadley Center. The Daily Show had a rather hilarious take on all this and it is well worth watching. It seems to me that virtually all of the criticism of climate researchers is rooted, not in a distrust of the science, but is instead based on an extreme fear of the consequences of their findings. Chaired National Academy of Sciences/National Research Council panel on Abrupt Climate Change, to advise the U.S. Government on research activities to address the possibility of climate surprises (Abrupt Climate Change: Inevitable Surprises, National Academy Press, 2002) and then led effort to publish synopsis for wider audience in Science; much additional advice on climate-change issues to government, including OSTP, NSF, EPA, NOAA, contacts in Mexico and Canada, much activity in the IPCC process, providing text to the NSF that was used in a speech by the U.S. President, meeting with the U.S. Vice President, and testifying before a U.S. Senate committee. Richard Alley is Evan Pugh Professor of Geosciences and EMS Environment Institute at Penn State. He is one of several Penn State earth scientists who contributes to the United Nations Intergovernmental Panel on Climate Change, which shared the 2007 Nobel Prize with Al Gore. Alley’s teaching philosophy focuses on helping students to discover the motivation, tools, and background knowledge to contribute to society as lifelong learners. Richard Alley discusses the latest climate change developments and what we can do to make a difference. Learn how continued carbon dioxide emissions could increase the spread of diseases, raise temperatures, and submerge entire countries under water and find out what you can do to quell the trend. Lastly, for those wondering about who runs Skeptical Science, the website is maintained by John Cook. I studied physics at the University of Queensland but currently, I’m not a professional scientist – I run this website as a layman. People sometimes wonder why I spend so much time on this site and which group backs me. No group funds me. I receive no funding other than the occasional Paypal donations. As the lack of funding limits how much time I can spend developing the site, donations are appreciated. My motivations are two-fold: as a parent, I care about the world my daughter will grow up in and as a Christian, I feel a strong obligation to the poor and vulnerable who are hardest hit by climate change. Of course these are very personal reasons – I’m sure everyone comes at this from different angles. I go more deeply into my motivations in Why I care about climate change. As readers of my weblog know, I have had a generally negative view of the objectivity of Skeptical Science (e.g. see). The four individuals who have been selected to “communicate” the AGU view of climate science are certainly welcome to express their individual views. However, they are presenting only one perspective of climate science. Any objective person who has knowledge of the climate system will immediately see this bias. However, those who are less familiar with the science issues will be misinformed by their perspectives. The AGU, by permitting this communication, is further losing its prestige as an objective framework to present scientific findings with respect to climate. 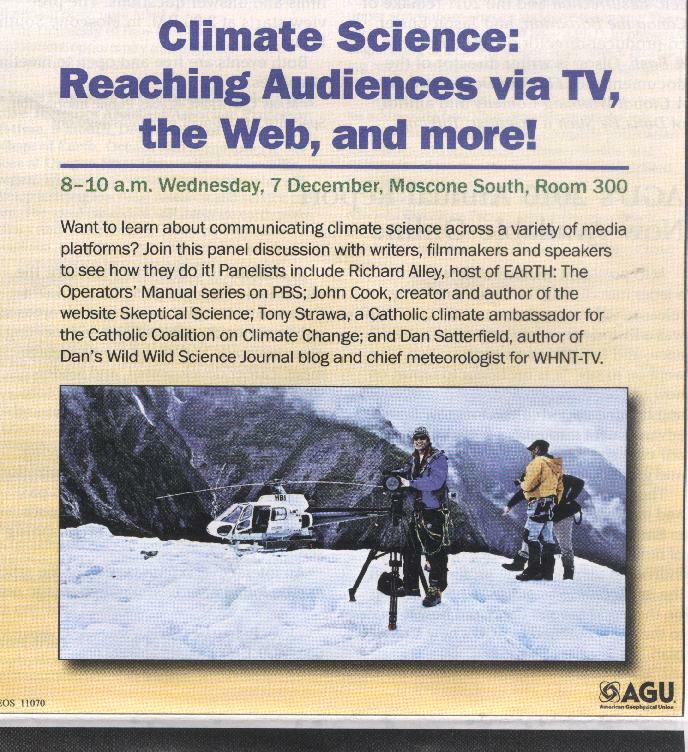 This AGU panel is presenting the Democratic viewpoint which I discussed yesterday.